Do you strain to hear someone in a one-on-one conversation? Is it difficult to follow dialogue involving two or more people? Do others tell you that your television or radio is too loud? If you’ve answered yes to any of these questions, you could be experiencing hearing loss. 1. You get confused or have difficulty focusing in noisy areas such as restaurants, malls, meetings, etc. One of the most common complaints of all individuals with hearing loss is difficulty understanding speech in noisy environments. It’s not so much that you can’t hear sound, rather you can’t understand what’s being said. 2. You rely more on reading lips or watching people’s faces as they talk. Sometimes, when we experience a medical condition, we can either consciously or subconsciously adjust the way we go about our days to accommodate our ailment. Consider those who have trouble seeing — they may squint their eyes to see clearly, or get closer to whatever object it is they’re trying to distinguish. The same goes for hearing loss; individuals often compensate for their inability to hear by trying to focus on the lips or faces of whomever they are speaking with, instead of focusing on the conversation at hand. 3. You have trouble hearing women’s and children’s voices. Typically, hearing loss varies across frequency ranges and the higher the frequency, the higher the pitch. With age, we are more likely to experience hearing loss in higher frequencies. Women’s and children’s voices are most commonly known for their high pitches (or frequency). Because of this, it’s often more difficult to hear what’s being said. Think about speaking with a male who has a deep, rumbling voice. Hearing him usually is not difficult, but when a female or child speaks with their distinctively soft, high-pitched tone, hearing isn’t as easy. 4. 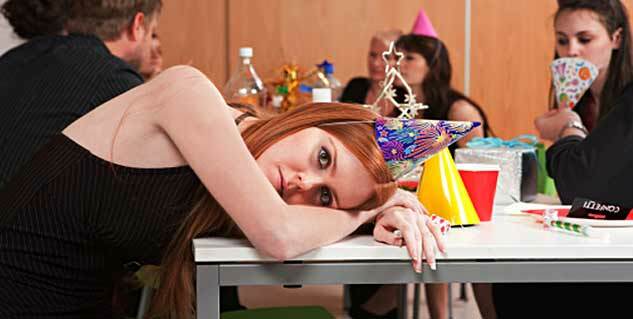 Avoiding social situations is a common behaviour of people experiencing hearing loss. Maybe you misunderstand people frequently, and as a result, your friends and family think you aren’t listening or engaging in a conversation. However, constantly straining to hear and follow conversation is emotionally draining, and it is understandable to feel frustrated because communication is an integral part of all our relationships. But you shouldn’t feel you must avoid social situations because you have difficulty hearing, and receiving treatment will help ensure you can continue experiencing the moments that mean the most. 5. When common sounds seem muffled, or people seem to mumble frequently, your hearing has likely diminished. While there are a variety of potential causes (e.g., a buildup of earwax or an ear infection), the tell-tale sign of conductive hearing loss is muffled sound. Conductive hearing loss occurs when there’s an obstruction or damage to the outer or middle ear, which prevents sound from travelling to the eardrum and to the tiny bones in the inner ear — thus affecting the ability to hear the loudness of sounds. For information on products that can help make life a little easier for those of you who are having hearing difficulties, take a look at www.sarabec.com.